Our Institute focuses on a wide range of problems in advanced manufacturing, which can be roughly categorized in three technology thrusts; each thrust has application on hard, soft and bio-materials. Below you can find some examples of current research projects. Prof. Tim Rupert is developing new nanostructured metallic alloys that demonstrate optimal mechanical properties and excellent thermal stability. Most importantly, his research group is using disordered interfacial phases to increase the toughness of these alloys. 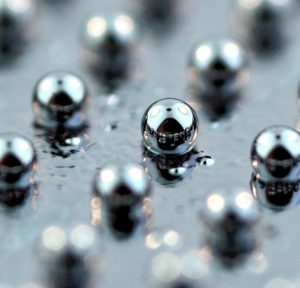 From a practical perspective, powder metallurgy methods are used, making the discoveries in this area scalable and useful for industry. Khalajhedayati, A., Pan, Z. and Rupert, T. J. “Manipulating the interfacial structure of nanomaterials to achieve a unique combination of strength and ductility.” Nature Communications 7, 10802, (2016). 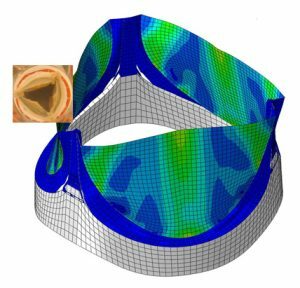 Researchers at UCI have developed tunable microchannel arrays out of elastomers. By applying a compressive strain to the system, the ionic conductivity can be tuned to a programmed value with great control. This development will enable new microfluidic and nanofluidic devices for research in biomedical and chemical engineering. Kuo, C.-C. et al. 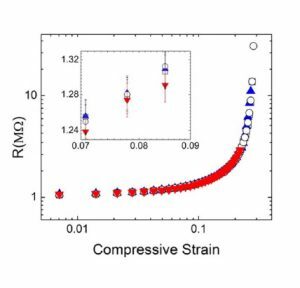 “Macroscopic strain controlled ion current in an elastomeric microchannel.” J. Appl. Phys. 117, 174904, (2015). 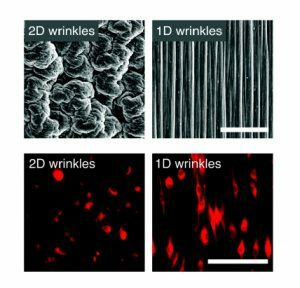 Wang, T., Luu, T. U., Chen, A., Khine, M. and Liu, W. F. “Topographical modulation of macrophage phenotype by shrink-film multi-scale wrinkles.” Biomaterials Science 4, 948-952, (2016). 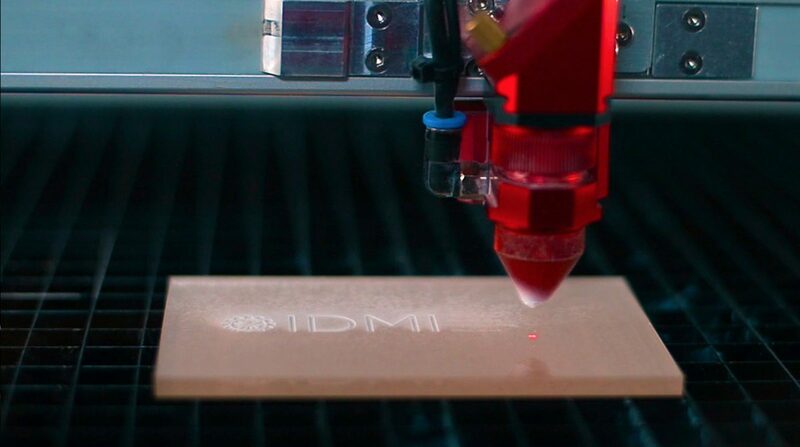 Additive manufacturing consists of physical domain components (such as stepper motors, heating filament, mechanical frame, etc.) which are coordinated and controlled by cyber domain components (such as firmware, G/M-code, etc.). However, the interaction between the cyber and physical domain components introduce zero-day vulnerabilities that may be exploited by an attacker. For example, an attacker may attack the digital process chain and modify the cyber-domain components to inconspicuously alter and compromise the integrity of the mechanical design of the object in the physical domain. In another example, an attacker may leverage the analog emissions from the side-channels to infer and breach the confidentiality of the information in the physical domain. At UCI, the Advanced Integrated Cyber-Physical Systems (AICPS) lab (http://aicps.eng.uci.edu/), directed by Prof. Al Faruque is working on ways to detect kinetic cyber-attacks (that causes direct or indirect effect in the physical domain through attacks on the cyber domain) , as well as creating novel attack models to breach the confidentiality of the manufacturing system . Rokka Chhetri, Sujit Rokka, Arquimedes Canedo, and Mohammad Abdullah Al Faruque. “KCAD: Kinetic Cyber Attack Detection Method for Cyber-Physical Additive Manufacturing Systems.” Proceedings of the 35th International Conference on Computer-Aided Design. ACM, 2016. Al Faruque et al. 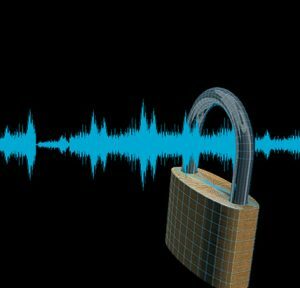 “Acoustic Side-Channel Attacks on Additive Manufacturing Systems.” 2016 ACM/IEEE 7th International Conference on Cyber-Physical Systems (ICCPS). IEEE, 2016. Researchers in Professor Valdevit’s group have designed, modeled, characterized and fabricated multistable architected materials, with applications ranging from shape reconfigurability to energy absorption and tunable phononic band gaps. The proposed shape-reconfigurable material is based on a modular system of bi-stable units with hinges that allow individual building blocks to be combined and recombined in different ways to create multi-stable structures. The living hinges allow the triangular units to snap into open or closed configurations. By carefully tailoring the location of the hinges and the assembly of the modular blocks, one can design architected materials that morph between two or more desired shapes with great precision, while maintaining strength and providing energy absorption. This property of matter could pave the way for manufacturing of highly adaptable components that are fully reconfigurable based on functionality. 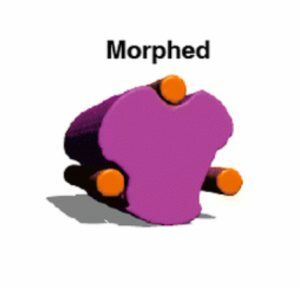 1-D, 2-D and 3-D architected materials can be designed, enabling complex shape-morphing patterns. Haghpanah, B., Salari-Sharif, L., Pourrajab, P., Hopkins, J., Valdevit, L. (2016). Multistable Shape-Reconfigurable Architected Materials. Advanced Materials, 28(36), 7915–7920. Researchers in the Esser-Kahn group at UCI have combined the basic elements of morphogenesis, reaction and diffusion, and a microvascular scaffold to pattern new synthetic materials. 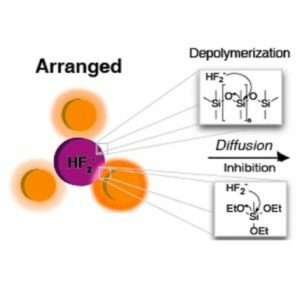 By balancing the various rates of depolymerization and inhibition of that depolymerization with a diffusive agent, materials that can continuously reshape their microstructure, adapt their functionality and improve their performance have been designed. Kleiman, M., Brubaker, K. S., Nguyen, D. T. and Esser-Kahn, A. P. “Bio-Inspired Morphogenesis Using Microvascular Networks and Reaction–Diffusion.” Chem. Mater. 27, 4871-4876, (2015). The gold standard for the treatment of large, complex kidney stones is percutaneous nephrolithotomy (PCNL), a procedure by which the stones are endoscopically removed through a small (1cm) access created in the patients back over the area of the kidney. Despite improvements in surgical techniques, complete stone removal remains challenging and many patients continue to require additional surgical procedures after PCNL for large and complex stones. Optimal access into the kidney assures the greatest chance of surgical success and stone clearance. The angle of entry through the back is of utmost importance as it determines a surgeon’s ability to access, ablate and extract all components of these complex kidney stones. Therefore meticulous surgical planning prior to PCNL is essential to determine the location and number of access routes needed to ensure complete stone clearance. Failure to remove the entire stone may result in the need for additional tract-placement and, in some cases, an additional procedure(s) at a later date(s). 3D printing technology allows for high fidelity, customized, and easily reproducible models that can be viewed as well as handled. Moreover, it has proved to be useful in preoperative planning in many surgical settings. In urologic practice, the creation of 3D printed models of kidney and prostate tumors improve preoperative planning and patient education. 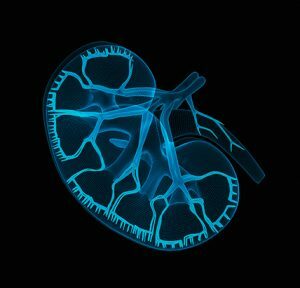 A team of researchers from the UCI Department of Urology, led by Prof. Landman and Prof. Clayman, and the Technical Director of IDMI, Mr. Ben Dolan, used the computer program, Materialise Mimics®, to create patient-specific 3D printed models of kidneys with complex kidney stones using routine preoperative standard cross-sectional CT images. With assistance from Stratasys, they printed high-quality kidney models from translucent clear resin and the stones therein from opaque, magenta colored resin. In an effort to facilitate preoperative planning by both attending and resident physicians as well as to aid in patient education, they used the 3D printed models to evaluate kidney anatomy, and the shape, configuration and location(s) of the stone(s). Patients were shown their personalized 3D printed model during the preoperative visit and allowed to physically examine the model while the nature of their disease, stone burden, and surgical procedure was discussed in detail. The results were presented at the American Urology Association meeting in San Diego, CA in May 2016. The abstract of the presentation can be found here. The Kheradvar lab at UCI has pioneered the development of hybrid heart valves, with the leaflets consisting of a thin perforated nitinol shell covered in biological tissue. A collaboration with the Valdevit group has recently led to a computational model that can be employed to identify fatigue—resistant optimal designs. These hybrid valves have the potential of addressing the shortcomings of both mechanical and bioprosthetic valves, the only two technologies currently available on the market. Researchers at the Irvine Materials Research Institute (IMRI) are developing new electron microscopy techniques for measuring material structure and properties simultaneously. 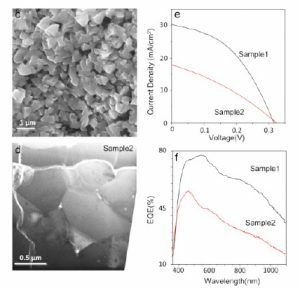 For example, in the figure shown below, the photocurrent and conductivity of individual interfaces of Cu2ZnSnSe4 nanoparticle solar cells are studied while also tracking chemical variations. 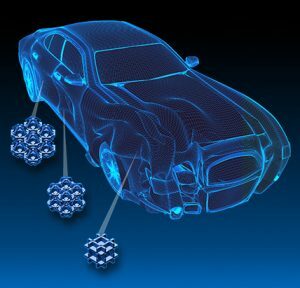 Such developments are essential for developing new materials and technologies with increased functionalities or performance. Xu, M., Liu, B., Graham, G. and Pan, X. “High resolution characterization of grain boundaries in Cu2ZnSnSe4 solar cells synthesized by nanoparticle selenization.” Sol. Energy Mater. Sol. Cells 157, 171-177, (2016). Prof. Shkel is developing novel micro-fabrication technologies for 3D MEMS. One goal is the implementation of a 6-axis micro inertial measurement unit (μIMU) on a single substrate. 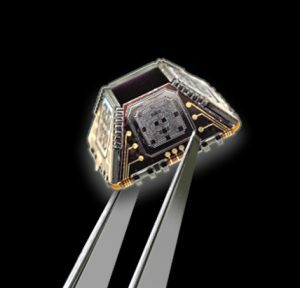 All inertial sensors are fabricated in parallel on a single silicon substrate, mechanically and electrically interfaced through flexible integrated thin-film polyimide hinges. When folded into a 3-D structure (i.e. a cube or a pyramid) the unit forms a single-chip 6-axis system. Due to the advantages of high aspect ratio SOI-based sensor fabrication, high-performance single axis sensors with low cross-axis sensitivity can be employed. Additionally, a clock, integrated circuitry, and power source can be included to create a highly compact standalone IMU.Connections for all sensors terminate on the bottom of the folded structure, allowing for surface-mount packaging of the device. Structures can be mounted either directly to a PCB, or to an adapter plate allowing for connection to a DIP package. 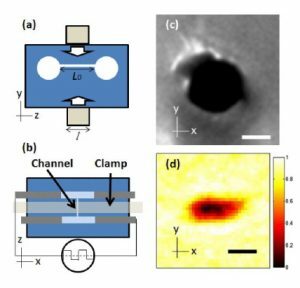 Sergei A. Zotov, Montgomery C. Rivers, Alexander A. Trusov, Andrei M. Shkel, “Folded MEMS Pyramid Inertial Measurement Unit,” IEEE Sensors Journal, vol. 11, no. 11, pp. 2780-2789, November 2011. Alexandra Efimovskaya, Yu-Wei Lin, Andrei M. Shkel, “Thru-Wafer Interconnects for Double-Sided (TWIDS) Fabrication of MEMS”, IEEE Inertial Sensors, Laguna Beach, CA, USA, 22-25 February 2016. Alexandra Efimovskaya, Doruk Senkal, Andrei M. Shkel, “Miniature origami-like folded MEMS TIMU”, IEEE Transducers 2015 Conference 2015, Alaska, USA, June 21-25, 2015. Researchers in the Guan Lab are building materials that you can tune, by tuning the bonds within them. Despite numerous strategies involving dynamic covalent bond exchange for dynamic and self-healing materials, it remains a challenge to tune the malleability and self-healing properties of bulk materials through simple small molecule perturbations. Researchers Olivia Cromwell, Jaeyoon Chung and Prof. Zhibin Guan used of tunable rates of boronic ester transesterification to tune the malleability and self-healing efficiencies of bulk materials. Specifically, they used two telechelic diboronic ester small molecules with variable transesterification kinetics to dynamically cross-link 1,2-diol-containing polymer backbones. 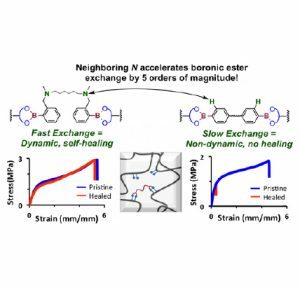 The sample cross-linked with fast-exchanging diboronic ester showed enhanced malleability and accelerated healing compared to the slow-exchanging variant under the same conditions. Their work creates the possibility of transferring small molecule kinetics to dynamic properties of bulk solid material and may serve as a guide for the rational design of tunable dynamic materials. The Irvine Materials Research Institute (imri.uci.edu) maintains a world-leading facility in advanced microscopy. 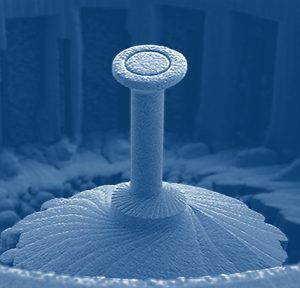 One of its top TEM microscopes is uniquely suited for atomic-scale characterization of biological materials. The JEM-2100F is an advanced high-resolution field emission transmission electron microscope equipped with cryo-pole-piece, cold stage, and Gatan K2 direct detection camera, and OneView camera, making it ideal to study both biological and materials samples at liquid nitrogen/room temperature. It can be applied for TEM imaging and electron diffraction at low temperature (liquid nitrogen), high-resolution lattice imaging, electron tomography and in-situ TEM. 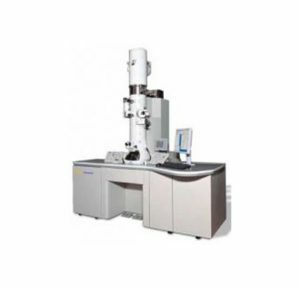 The TEM can be used to reveal the morphology, 3D cell/particle structure, crystal structure, interface/defects of biological and materials samples. With different holders, chemical reaction, crystal growth, and other in-situ experiments may be carried out.